The Canon EOS 5DS R offers a 50.6 megapixel full-frame CMOS sensor along with low-pass cancellation filter for improved resolution and detail in photos. 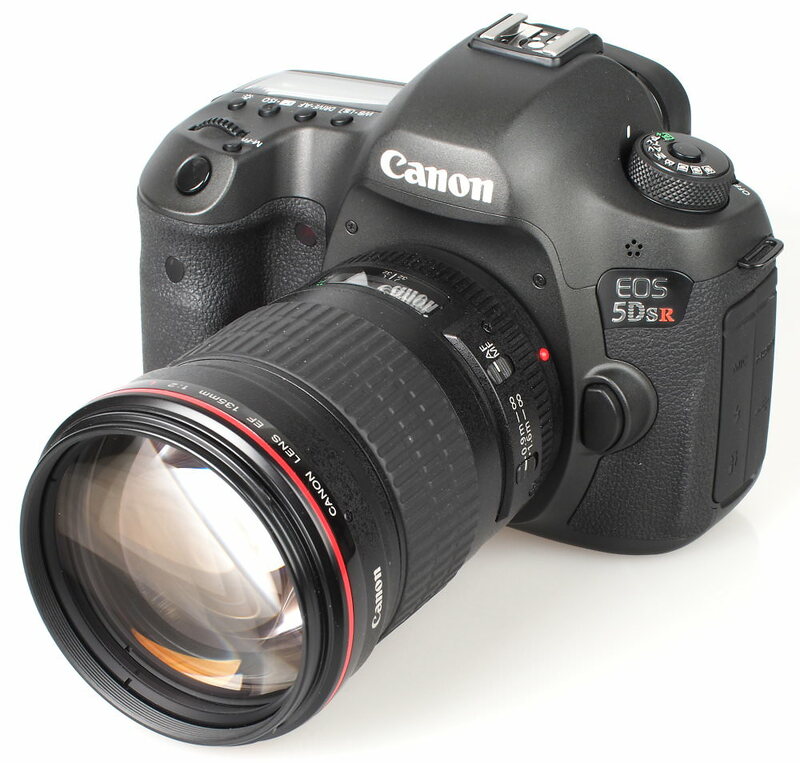 The Canon EOS 5DS R is the top of the range full-frame 50.6 megapixel Digital SLR from Canon, and sits above the Canon EOS 5DS, with a low-pass cancellation filter designed to maximise the sharpness of the sensor. 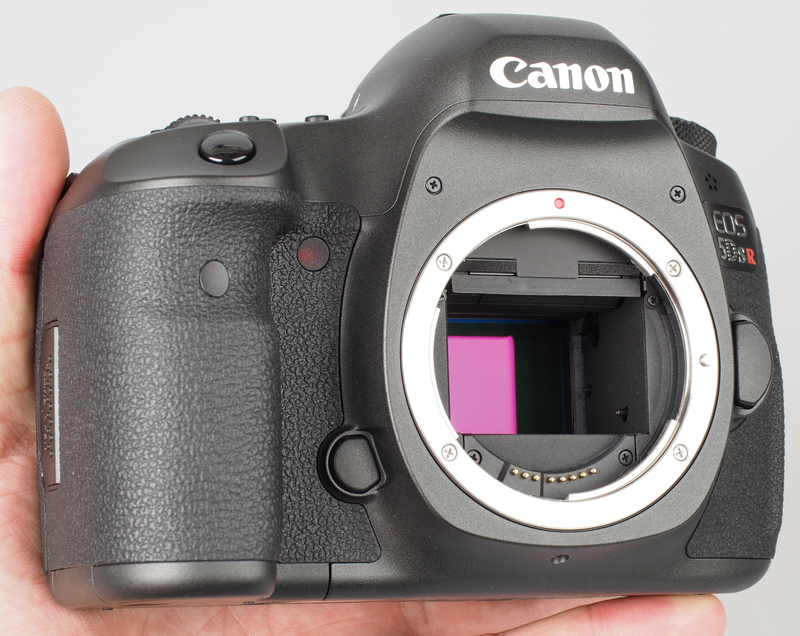 The camera body is based on the 5D Mark III with a slightly golden finish and the red R marks the 5DS R out from the 5DS. 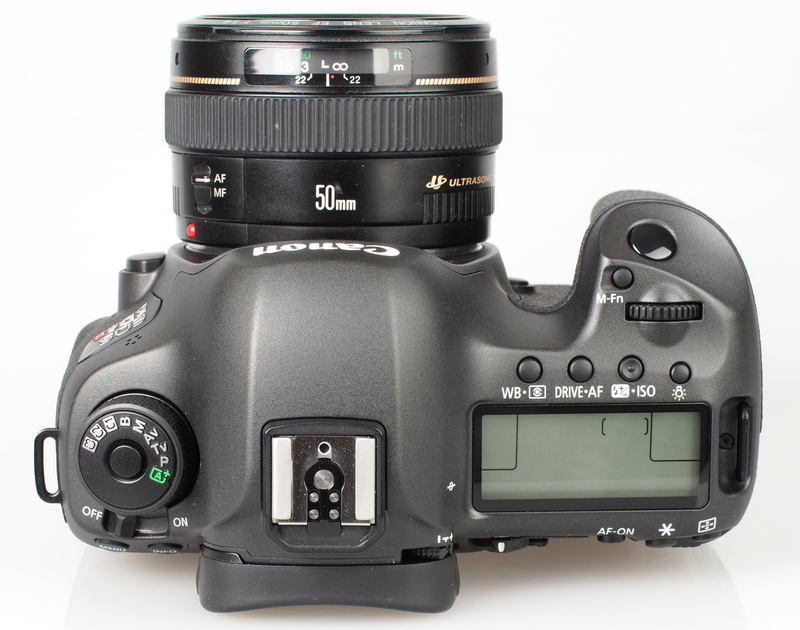 The Canon EOS 5DS R features a 50.6 megapixel full-frame CMOS sensor like the 5DS (without the R), however the sensor features a low-pass cancellation filter, which means there is not the usual anti-aliasing filter in front of the sensor. This will result in the camera recording improved detail and resolution, although at the risk of increased moire and false colour. The camera takes photos that are 8788 x 5792 pixels in size, and the sensor has been developed in-house by Canon. The camera features 1:1x, 1.3x and 1.6x crop modes, giving the option to shoot 33-megapixel (5792x5792), 30-megapixel (6768x4512) and 19-megapixel (5424x3616) images respectively. The camera has an ISO range of ISO100 to ISO6400, which extends down to ISO50 and up to ISO12800, and can shoot at 5fps in high-speed continuous shooting mode. Due to the high-resolution sensor, Canon are emphasising the importance of correct technique on the Canon Professional Network website, as well as high-quality lenses, such as the L series of lenses, and you can view the details of recommended lenses on Canon's website. There is a newly developed Fine Detail Picture Style which has been included to prioritise gradations and detail captured. You can adjust in-camera sharpening parameters such as threshold and fineness for JPEG files - meaning you should be able to get detailed and sharp JPEG images straight from the camera. The EOS 5DS R uses Canon’s newly developed Mirror Vibration Control System to reduce vibrations caused by internal movements within the camera, which can spoil image sharpness and reduce resolution. Cams are used to drive the mirror up and down in a more controlled fashion, avoiding any sudden stops and also softening the shutter-release sound. Dual DIGIC 6 processors are needed to process the large files, which are roughly 60-70MB when shooting raw files. USB 3.0 connectivity allows fast tethered shooting and remote camera control, as well as the ability to transfer images from the camera to your computer at high speed. The camera uses the same 61-point AF system from the Canon EOS 5D Mark III, which features 41 cross-type focus points, including 5 extra-sensitive double cross-type points for extra accuracy, with a range of -2 to 18 EV. There is a customisable quick control screen, letting you choose the options available when you press the Q button. The camera benefits from a large 100% view optical viewfinder (OVF) with 0.71x magnification, and a large rubber eyecup. You can also customise the controls on the camera. The camera records full HD video with stereo sound, and can create time-lapse movies in-camera. There is a built-in HDR mode that will automatically combine three shots taken at different exposures for enhanced dynamic range. 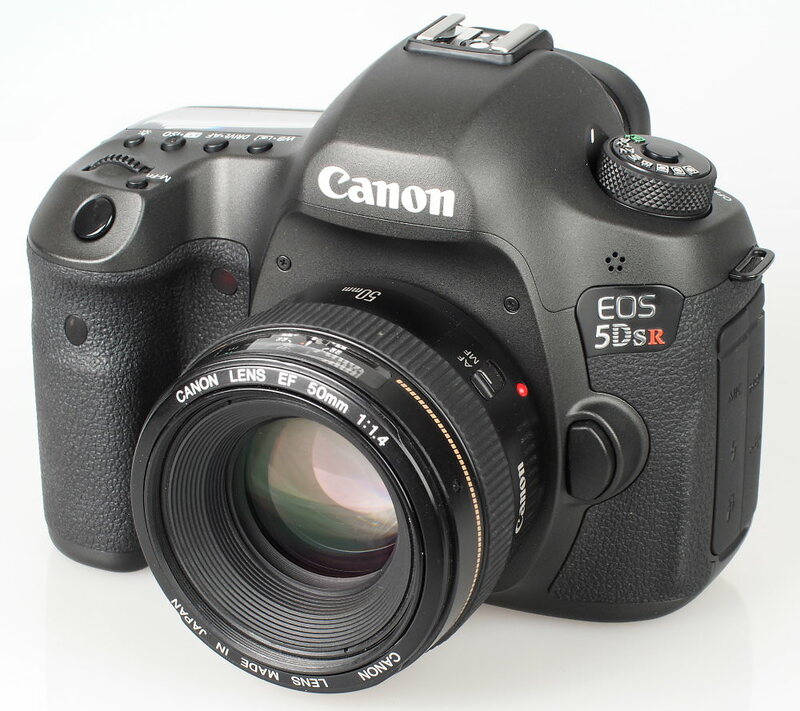 The Canon EOS 5DS R features the trustworthy design and handling of the Canon EOS 5D Mark III, with a slightly updated finish, and a slight golden sheen to the camera body along with a red R makes the camera standout as slightly more exclusive than your more "run of the mill" 5DS. Build quality is excellent, as you would expect on a £3000+ camera, and the camera's body is weather sealed. The camera has a thicker chassis and tripod socket than found on the 5D Mark III. There are people still shooting with the 10-year-old Canon EOS 5D Mark I, so there's no reason why this camera shouldn't last as long or indeed longer. The full-frame Canon DSLRs is quite heavy, however with a large handgrip covered in textured rubber you can get a good grip on the camera. There is a textured rubber area on the left of the camera as well. The ports on the side of the camera are updated to include: Mic, HDMI, USB3, flash, remote sockets, along with additional screw holes to attach future accessories. 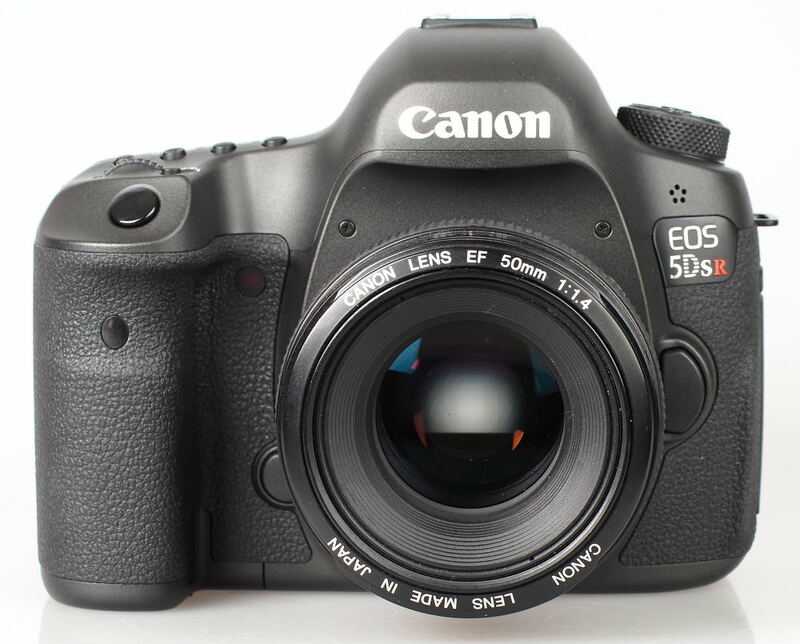 The 5DS R features the same 61 point AF system as the Canon EOS 5D Mark III, and the focus points cover a reasonable area of the frame, covering the full width of the APS-C 1.6x crop mode. Focus is possible in low light conditions down to -2 EV and up to 18 EV. The optical viewfinder is large (with 0.71x magnification), and clear with a large rubber surround, as well as dioptre adjustment. The 3.2inch screen is large, clear, and bright with a good resolution of 1040K dots and viewing angles are good, although the refresh rate in live view could be quicker and is set at 30fps. The buttons, controls and layout will be familiar to anyone who has used other Canon DSLRs with numerous external buttons and controls. This makes it quick to change settings, thanks to the top illuminated LCD display giving shooting information at a glance, as well as showing options as you change them, so that you don't have to resort to looking at the rear screen, or enter the menus. 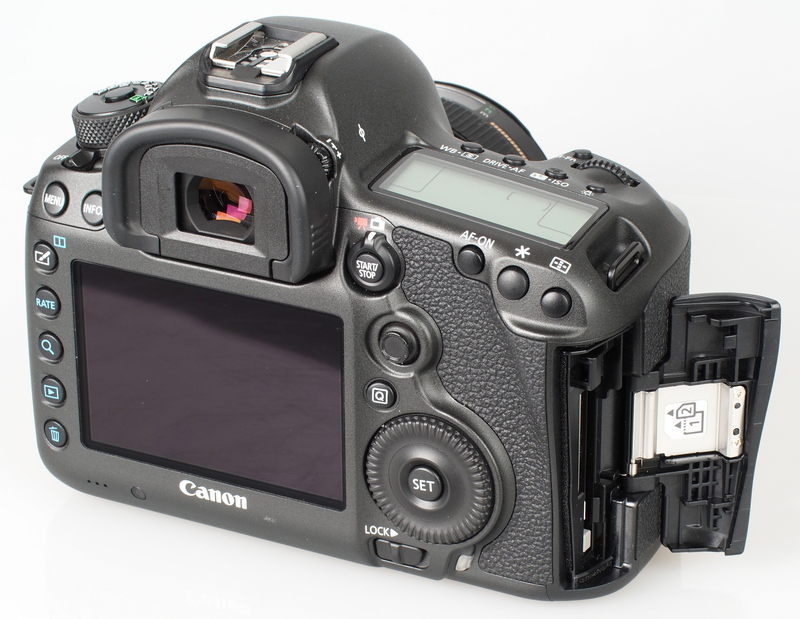 The Canon EOS 5DS R, like other Canon EOS cameras, has a logical and neatly arranged menu system with colour coded sections, letting you change additional settings and options. The large number of buttons and controls on the camera mean you can change settings quickly without entering the menus, and the Q button makes it easy to change settings on the rear screen - the options here can be customised so you have quick access to your favourite settings. There is built-in help that can be accessed by pressing the INFO button, although studying the manual is recommended to fully understand all of the options. A new comparative playback function lets you zoom in and view images side-by-side on the rear screen in playback, making it easy to see which image is correctly in focus. Along with a variety of focus options in the menu system, there are auto focus (AF) scenarios built into the camera so that you can choose the most appropriate for your shooting situation. The choices optimise the following three options: Tracking sensitivity, Acceleration / Deceleration Tracking, and AF point auto switching - each can be increased or decreased +/-2. Battery life - Battery life is rated at 700 shots according to Canon / CIPA test results, which is good, although doesn't match the 950 shots that the 5D Mark III offered. 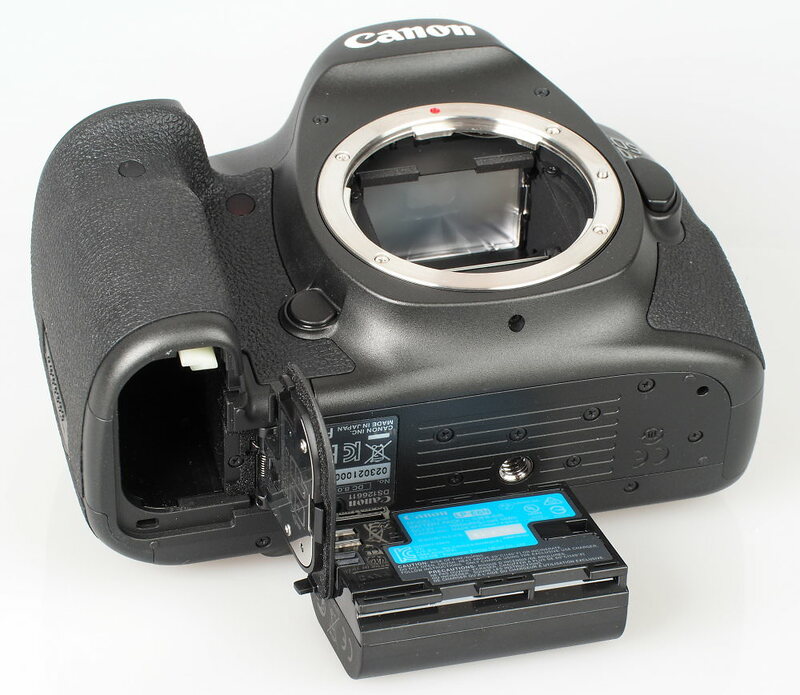 Battery life can be extended with the optional battery grip, and the camera is compatible with the 5D Mark III battery grip. I own this camera and have been using it for a month. I find it exceedingly comfortable and familiar though the menus are extremely detailed..more than I want and I essentially shoot the way I,would have with a film camera of days past with shutter priority and central 9 point focussing as I have been at this a long time. I do have definite and certain comment about lens quality. Because the sensor produces a huge raw file dimension of somewhere around 19 by 28 inches at 300 dpi it OS as of one has a contact print right out of the camera and therefore I have found lenses have an easy time of it resulting in extraordinary optical quality with every lens I own from the Al lenses down even to a Sigma 125-400 zoom which was. To known for super resolution but competent. I have tested all my assorted lenses with this camera. They are all flcussing well and since I work as a standard as a resized 24 byn36 inche 300 dpi image I can attest I have seen only improvements in the files from all the other canon cameras heretofore used. Rather than the lenses failing under the unblinking eye of a high resolution sensors quite the opposite is the result. The low level,of needed re sampling for me gives me a jaw dropping crystalline clarity and detail never seen from any of my lenses before. Further extremities of cropping result in images that were like an unresampled 5 D Mark II full frame images!!! Astonishing it is...I presumed I would have to upgrade some lenses or another but no! The soft mirror response has made handholding of this camera even with a long lens a no brainer so long as it has image stabilization. This was not always the case with my 5D Mark II. Conclusion is, don't sweat feeling the need to replace your lenses in the purchase cost of this new camera. It is a wonderful breakthrough. I own this camera and have been using it for a month. I find it exceedingly comfortable and familiar though the menus are extremely detailed..more than I want and I essentially shoot the way I,would have with a film camera of days past with shutter priority and central 9 point focussing as I have been at this a long time. I do have definite and certain comment about lens quality. Because the sensor produces a huge raw file dimension of somewhere around 19 by 28 inches at 300 dpi it OS as of one has a contact print right out of the camera and therefore I have found lenses have an easy time of it resulting in extraordinary optical quality with every lens I own from the Al lenses down even to a Sigma 125-400 zoom which was. To known for super resolution but competent. I have tested all my assorted lenses with this camera. They are all flcussing well and since I work as a standard as a resized 24 byn36 inche 300 dpi image I can attest I have seen only improvements in the files from all the other canon cameras heretofore used. Rather than the lenses failing under the unblinking eye of a high resolution sensors quite the opposite is the result. The low level,of needed re sampling for me gives me a jaw dropping crystalline clarity and detail never seen from any of my lenses before. Further extremities of cropping result in images that were like an unresampled 5 D Mark II full frame images!!! Astonishing it is...I presumed I would have to upgrade some lenses or another but no! The soft mirror response has made handholding of this camera even with a long lens a no brainer so long as it has image stabilization. This was not always the case with my 5D Mark II. Conclusion is, don't sweat feeling the need to replace your lenses in the purchase cost of this new camera. It is a wonderful breakthrough.